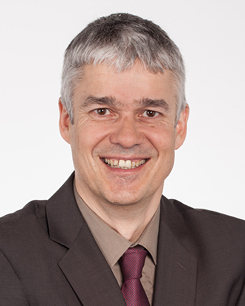 Jörg Weisse studied physics at the Technical University of Berlin and completed his studies with a diploma in physics. The subject of his thesis was the “position- and time-resolved fluorescence spectroscopy of organic molecules”. After the nuclear power plant disaster in Chernobyl, Jörg Weisse worked at the radiation measuring station of the Berlin Senate. Here he expanded his knowledge, in particular in the fields of instrumentation technology and nuclear physics. While working for a tool manufacturer, he gained insights into their business processes and into mechanical engineering and toolmaking. In line with a long family tradition, Jörg Weisse is the third generation to work in the field of industrial property protection, which he has done since 1994. In the years from 1994 to 1997, he was trained as a patent attorney in the Weisse & Wolgast law office, where he finally became a partner in 1997. He merged with the Velbert location of the Weisse & Wolgast patent attorney office in 2013 to form the business partnership Weisse, Moltmann & Willems Partnerschaftsgesellschaft, of which he is now a partner.